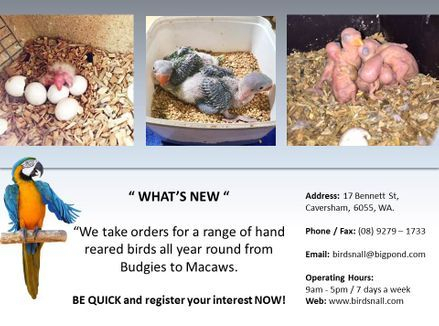 Birds 'n' All are located at 17 Bennett St, Caversham, Perth, Western Australia, and continue to be a successful, leading business in the avian industry. 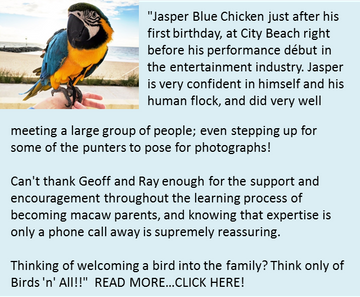 The owners Geoff and Ray have over 35 years experience in aviculture and hand rear many Australian native and exotic birds, from the playful Weiro, Pink & Grey Galah, Indian Ring-neck, Alexandrine, Sun Conure, Major Mitchell, Eclectus, Corella, Galah/Corella hybrid, Rainbow Lorikeet, to the majestic Macaw, Red & White Tail Black Cockatoos to name but a few. 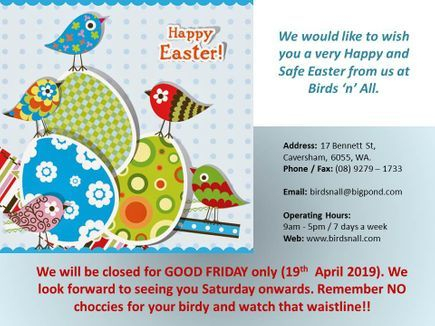 Birds 'n' All is the only West Australian bird dealership that is owned and managed by dedicated Aviculturists who in addition to the retail sale of birds are involved in the conservation of native species. This includes the conservation of the Naso Redtail Black Cockatoo (Calyptrohyncus Banksii Naso) and the Endangered Carnaby Cockatoo (Calyptorhynchus Latirostris) indigenous to Western Australia. Plus Captive Breeding Programs for the threatened Muir's Corella (Cacatua pastinator pastinator) and paticipated in the Red Eared Firetail Finch (Stagonopleura oculata) captive breeding program. At Birds 'n' All, we are highly regarded in our level of expertise and knowledge of Australian and exotic species of birds. There is a very large selection of birds to choose from such as Budgies, Canaries, Finches and Weero's for the beginner to Red, White and Yellow Tailed Black Cockatoo's, Sulphur Crested Cockatoos, Major Mitchell's, Macaws and Eclectus for the more advanced aviculturist, whether you wish to have a hand-reared, breeding pair or an aviary bird, you will not be disappointed for choice. Our friendly and helpful staff who also have a wealth of knowledge, just ask for assistance and they will be more than happy to help you with your queries and requirements. If you have a question please go to our CONTACT US page and submit your query, we will respond as soon as humanly possible. To view our latest updates, specials and general information...please go to our BLOG or 4 SALE pages.